In the aftermath of the Decepticons' attack on Autobot City in 2005, several injured and dying Decepticons were cast into the void of space in order to lighten the load for the return trip, and were soon drawn in by the world-eater, Unicron. After making a deal with Unicron, the deposed Decepticon leader, Megatron, was reborn as Galvatron. Unicron then used the bodies of the other injured Decepticons to create new troops who would serve Galvatron in his quest to destroy the Autobot Matrix of Leadership. 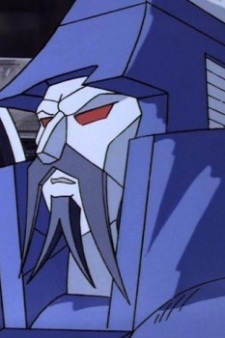 Created from the battered form of Thundercracker, Scourge was the leader of a group of robots (identical in appearance to Scourge himself) known as the Sweeps. Scourge did not immediately display any overt personality traits after his creation, beyond his unswerving loyalty to Unicron and Galvatron. Scourge began to come into his own after the apparent destruction of both. Less willing to take orders from Cyclonus, but doing so all the same, Scourge used his scanners to locate Galvatron's body, seeing across the galaxy into the Hydran system, where Galvatron lay in a pool of plasma lava on the planet Thrull. Upon arrival on the planet, Scourge was the one to pull Galvatron from the lava, but he and the Sweeps were then attacked by the deranged Galvatron, who only stopped his assault when Scourge professed his loyalty. Scourge became one of Galvatron's most prominent minions, despite his lack of any real hierarchical weight, and would regularly lead the Sweeps on missions, often with Cyclonus, with whom he discovered the paradise planet of Paradron, which they quickly overthrew for Galvatron.